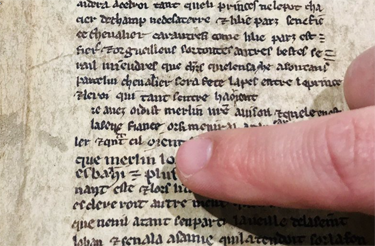 One Feedback on "13th-Century Tale of Merlin and Arthur, Found Reused as Bookbinding"
Huh? Nooo… Geoffrey of Monmouth, a cleric in England, published the well-developed core of the Aurthurian legend, as “The History of the Kings of Britain” (Historia regum Britanniae), in Latin, in the mid-1130s. It immediately pegged the NYT bestseller list, in Latin, and created a genre across Europe that churned out a Harlequin Romance library of derivatives, for many generations. The French, yes, picked it up and were leading contributors, introducing several key figures & themes … but they did not originate the venue. They could read Monmouth’s Latin just fine, since it had been introduced to England from Normandy, just 90 years previously. Really garbled account of Aurthurian, “Matter of Britain” story here … Atlas Obsura? I’ve seen them before, didn’t know of a problem … but this is a biggie, for sure. … Otherwise, normally a fine & unique blog at NYM!